How do I apply BELBUCA®? Before you begin, make sure the inside of your mouth is moist, using your tongue or by rinsing your mouth with water. Be sure your fingers are clean and dry. To apply BELBUCA®, just peel, place, and press. Simply peel and tear open the package to carefully remove the film. Place the film on your finger and press the yellow side against the inside of your cheek. It may take a few times to get accustomed to using BELBUCA®. Practice applying BELBUCA® with a placebo (inactive) film provided by your healthcare provider. Where is the right place to put BELBUCA® inside my cheek? BELBUCA® should be applied to the middle of the inside of your cheek. Do not place the film too high or too far back on your cheek. Avoid applying the film to areas of your mouth with any open sores or lesions. Can I eat, drink, or talk when the film is in my mouth? Do not eat or drink until the film has completely dissolved. 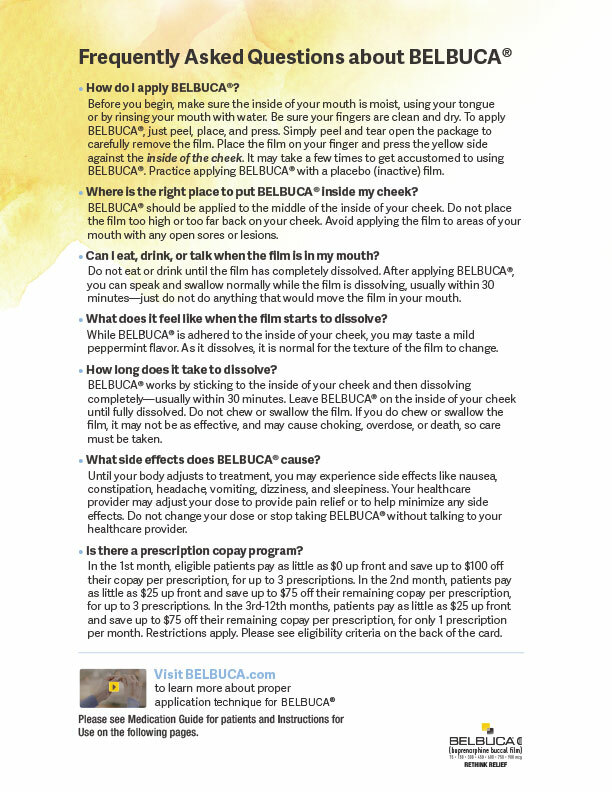 After applying BELBUCA®, you can speak and swallow normally while the film is dissolving, usually within 30 minutes—just do not do anything that would move the film in your mouth. What does it feel like when the film starts to dissolve? While BELBUCA® is adhered to the inside of your cheek, you may taste a mild peppermint flavor. As it dissolves, it is normal for the texture of the film to change. How long does it take to dissolve? BELBUCA® works by sticking to the inside of your cheek and then dissolving completely—usually within 30 minutes. Leave BELBUCA® on the inside of your cheek until fully dissolved. Do not chew or swallow the film. If you do chew or swallow the film, it may not be as effective, and may cause choking, overdose, or death, so care must be taken. What side effects does BELBUCA® cause? Until your body adjusts to treatment, you may experience side effects like nausea, constipation, headache, vomiting, dizziness, or sleepiness. Your healthcare provider may adjust your dose to provide pain relief or to help minimize any side effects. Do not change your dose or stop taking BELBUCA® without talking to your healthcare provider. Is there a prescription copay program? In the 1st month, eligible patients pay as little as $0 up front and save up to $100 off their copay per prescription, for up to 3 prescriptions. In the 2nd month, patients pay as little as $25 up front and save up to $75 off their remaining copay per prescription, for up to 3 prescriptions. In the 3rd-12th months, patients pay as little as $25 up front and save up to $75 off their remaining copay per prescription, for only 1 prescription per month. Restrictions apply. Please see eligibility criteria on the back of the card. Visit our Savings page to download a copay card for your BELBUCA® prescription.